What are Capstar tablets and who are they for? Nitenpyram, the active ingredient in Capstar, belongs to the chemical class of neonicotinoids which bind and inhibit insect (flea) specific nicotinic acetylcholine receptors. Nitenpyram interferes with normal nerve transmission and leads to the death of the insect (flea). What is the active ingredient in Capstar tablets? The active ingredient, nitenpyram belongs to the chemical class of neonicotinoids which bind and inhibit insect specific nicotinic acetylcholine receptors. Nitenpyram interferes with nerve transmission and leads to the death of adult fleas. Nitenpyram does not inhibit acetylcholinesterase. Effects on fleas (Ctenocephalides felis) may be seen as soon as 15-30 minutes after administration of the product to the host animal. This coincides with the first blood meal taken by fleas after sufficient blood levels are reached. Between 95% and 100% efficacy is observed within the first 6 hours and 100% efficacy is reached within 24 hours with no residual activity. Nitenpyram is rapidly and to over 90% absorbed from the gastrointestinal tract of cats and dogs. Feeding does not affect absorption in dogs. Feeding slightly delays Tmax in cats without affecting the other pharmacokinetic properties and without affecting efficacy. The maximum blood concentration is reached after 0.5 to 2 hours in both fasted target species and the elimination half-life is about 4 hours in dogs and 8 hours in cats. More than 90% is eliminated in the urine within 1 day in dogs and 2 days in cats, mainly as the unchanged molecule. Cardboard box with 1 blister that contains 6 tablets. What is in Capstar tablets? How do I use Capstar tablets? 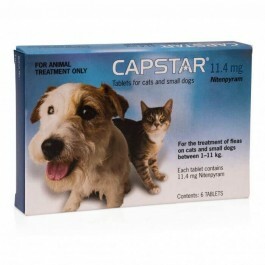 One CAPSTAR 11.4 mg tablet should be given to cats and small dogs weighing 1 kg to 11.0 kg when a flea infestation is detected. The frequency of treatment depends on the degree of infestation. In the case of a severe flea infestation, it may be necessary to treat the animals every day or every other day, until the flea infestation is controlled. Treatment may be resumed if fleas reappear. No more than one treatment should be given per day. Tablets should be given orally, with or without food. In order to improve palatability, tablets can be disguised in a small quantity of food immediately prior to administration. CAPSTAR does not have persistent activity. To prevent re-infestation, a suitable treatment to control immature stages of the flea life cycle is recommended. The veterinary surgeon should establish an appropriate treatment regime. Do not use on animals less than 4 weeks old or weighing less than 1 kg as these groups of animals were not studied. For the first hour after administration, the pet may scratch more than normal. This effect is caused by the fleas reacting to the product. In very rare cases in cats this may present as transient signs of hyperactivity. Pregnancy :Can be used during pregnancy. Lactation: Can be used during lactation. Laboratory studies in rats and rabbits have produced no evidence of teratogenic or foetotoxic effects and the safety of the product was demonstrated in pregnant and lactating cats and dogs. None known. No adverse drug reactions were seen in clinical studies when nitenpyram was administered with other veterinary medicinal products including commonly used flea products, anthelmintics, vaccines or antibiotics. if necessary Nitenpyram is well-tolerated by the target species. Overdoses up to 50 mg/kg in cats and up to 70 mg/kg in dogs were asymptomatic. Side-effects such as salivation, vomiting, soft stools, seizures, or decreased activity are observed at higher dosages and their seriousness increases as dosages increase. Symptoms disappear quickly and recovery is complete by 24 hours after overdosing because of the rapid elimination of nitenpyram. During 6 months of daily dosing in cats and dogs no clinically significant treatment-related side effects were observed. Is there any further advice I should know about Captar tablets? CAPSTAR does not have persistent activity. Frontline Plus Spot-on solution is an easy to use, double action treatment and preventative for flea and tick infestations in cats and ferrets. Cazitel tablets treat mixed infections in cats caused by roundworms and tapeworms.